Ask The Bellwether: How do you make a good looking 2-ply yarn? How do you make a good looking 2-ply yarn? 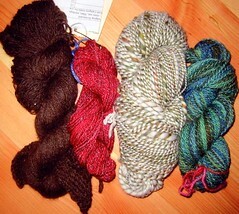 Kate from Massachusetts asked, "Could you please do a blog entry on how to ply a 2-ply yarn that comes out well? Mine never seem to look good." Thanks for asking, Kate. There are alot of factors that affect how the yarn comes out. One thing to consider is your own opinion -- I always am harder on my yarn than on other peoples' handspun. It took someone (several someones) saying to me, 'actually yours is as good as hers' when I was trying to tell them my yarn wasn't as good as another local spinner whose yarn I always drool over. Talk about an ego boost! Well, once I finished patting myself on the back, I decided to be less hard on myself, and now I am enjoying my yarn alot more! Some blends are made to give textured results -- so if you are using such a blend, such as the Crosspatch batts shown here, then you should expect texture in your yarn, not a smooth result. That's why Joan puts on all her packages, "This blend spins into a textured yarn." If your goal is a smooth yarn with a balanced ply, then make sure you are starting with a fiber or blend that will spin into one. Next, you need to sample. Spin a little up on your spindle or wheel and do a ply-back test. To do this, relax the yarn so it can twist back on itself as shown in the picture. This natural ply-back shows you what your 2-ply will look like. In the picture, you can see it is very fluffy -- this is great for a single, but a bit loose for a 2-ply unless you want a really fluffy yarn. Generally I like my 2-ply a bit tighter than this, because if it's this fluffy, the needles are likely to split the yarn all the time. And I want to enjoy knitting it as much as I enjoy spinning it! So, the ply-back tells you several things: are you spinning your singles fine enough or thick enough for your final 2-ply yarn? Do you have enough twist in the singles for a nice 2-ply yarn? Keep modifying the amount you draft and the amount of twist you put in until you are happy with the result -- that's the sampling you need to do up front, to get a result you need. The amount of twist for the 2-ply is a personal choice, based on your intended use of the fiber and the fiber itself. The ply-back test is a tool to help you judge if you have a yarn suited to its intended purpose. Once you have a nice 2-ply ply-back test result, break off a length of it (yes, this is the sample you save!). I take a piece of cardboard and wrap it around, fluffing out the end so I can see how much was drafted, and keeping the other end 2-plied so I can see how much twist is in it. 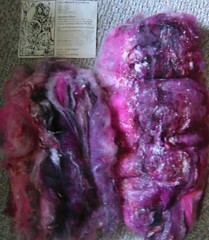 Keep this card in your spindle tote or with your fiber/wheel, and put it nearby so you can see it while you spin. To keep your singles a consistent thickness, keep in mind how much you need to draft, how you were spinning the yarn -- were you squeezing as you went, or not -- and do the ply-back test to check the amount of twist you have in it. I'll do that little ply back test for almost every length I spin -- at least once a yard. That way, if I've wandered into the land of too much twist, I can put a little less in the next yard and have it all even out in the wash. Or, if I've put in too little twist, I can put a little extra in the next yard. So, you have all your singles spun -- now, it's time to ply! If you can let your bobbins or spindle rest, overnight or a couple of days, the singles will be alot easier to work with, because the twist will have begun to set in them. However this means you can't test for a balanced ply when you do ply -- because if the ply "seems" balanced, then you have actually under-plied your yarn. Oops. 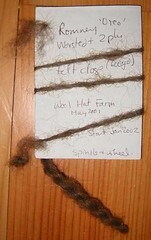 So, pull out that sample card again and look at that nicely plied sample -- that is what you want your ply to look like. When you first start the plying, put in some twist, and compare it side-by-side with that sample. Are the two plies in your newly spun at the same angle as those on the card? yes? yay! no? try adding twist or taking twist out until they match. Keep doing this until you get a feel for how much twist you need to put in. Now, if you have good light and eyesight then you can also look at the individual fibers -- a balanced ply will have the individual fibers running parallel along the length of the yarn. I can only do this balance test when I have a multi-fiber batt like the one shown above -- pink, black, and white I can distinguish; individual fibers of the same oreo brown, I cannot. Once you are comfortable with the amount of twist, be sure to compare to the sample card again every so often so you don't wander too far away from your goal. Whew! now you have a nice bobbin full of 2-ply yarn. But you aren't done yet. Washing the skein is just as important, especially if you made twist adjustments in the singles, and to balance out the amount of twist in the yarn along its length overall. So, wash your skein in a sink of warm water with a little wool wash or dish soap (why? ): fill the sink with water and soap, let the skein sink into it for 20 minutes, no agitation. Then squeeze out the skein, refill the sink with just water, and let it soak for 10-15 to rinse. Re-do the rinse bath if needed. Once it is washed and the water is squeezed out, roll it up in a towel to squeeze out some more. Then take the towel-and-skein by one end and whack it on the counter top. Really loudly -- it makes everyone in the house come running! Do the same from the other end. This helps distribute the twist along the skein, very lightly fulls the yarn to make it have a nice finish, and helps halo-y yarns to halo (angora and mohair). If that's not really your thing, then take the squeezed out skein and hang it around your wrists; then bring your hands together and quickly apart, to jerk the skein a bit. This also helps distribute twist around the skein. Hang the skein without weights to dry -- if it is balanced, then at this point it should hang evenly without twisting on itself. If it isn't balanced, then see these notes on tips on after-the-spinning fixes. Brown skein is 2-ply llama, spun on a spindle, when I was still learning about plying. It's a little underplied, and the spinning in the singles is also a little uneven. But it's a lovely laceweight yarn and the other half of the skein knit into a lovely little shawl similar to this one. Red skein is 2-ply Louet Gaywool multicolor merino/silk blend top, spun on a Louet S-45. It has a nice twist; this top was really nice to spin, it drafted out evenly (so take what I said about top above with a grain of salt). And this yarn turned out very well -- it got a blue ribbon :-) but there's only an ounce of it, so I have no specific plans for it. Marled skein of white and greens is Cormo handspun ... but, I didn't spin it, LOL. It is nice and cushy, the spinner did a great job of spinning a lofty fiber, which is what Cormo wants to be. And, it's not the most even spinning but it works with this fiber and the marling. I also had some white Cormo handspun by the same lady, and that is now a cable hat (the "cable sampler" in Cable Needle Freedom). The blue and greens skein is Corriedale two-ply, some of my most recent spinning, done on a Majacraft Suzie Alpaca wheel (I sold my Little Gem and Schacht to replace them with this wheel, which has nice features of both!). I used the sampling described here, though I admit I didn't write anything on its sample card as I spun it up one day and plied it the next. There you have it -- everything I know about making a good looking 2-ply yarn. If you want to put your yarn in competitions, there are a few more after-the-spinning tips I can give you. If you want another viewpoint on spinning a good-looking 2-ply, Abby has recently started a new thread on her blog on plying! Talk about serendipity. Questions, comments? fire away -- comment here or email them in. Thank you for doing this post, Amelia! I particularly like the ply-back card idea. It's been very helpful. I am setting the twist on my first 2 ply now using your post. Thanks so much for being so thorough. It is really helpful for us newbies. I got here through a link from the Spindlers list and I will keep looking at your blog! Spinning Spider Jenny has posted a great blog entry showing her balanced two ply. And Abby Franquemont has a great a YouTube video with tips on even plying.